Anything you want to know about Borg Warner 78 Series diffs, can be found here. VLTs and VL V8s were all built with 4 pinion 28 spline centres, with LSD as an option (noted by a brown filler plug), running single piston disc brakes, upon live axle (semi-floating) differential (non-IRS) housings. Otherwise, naturally aspirated VLs were built with 2 pinion 25 spline open wheel differentials (noted by a black filler plug; unless optioned [with LSD] otherwise), running drum brakes (unless optioned otherwise; see below). The diff housing measures 1400mm in width, axle flange to axle flange (sedan and wagon). The type of centre fitted can also be determined by the diff tag (where present), secured under one of the cover bolts. See here. Across the VL range, LSDs and disc brakes were optional (not restricted to being present only on turbo or V8 models). V8 VL's were able to optioned with the same 4 pinion 28 spline LSD centres, running the same disc brakes, however they were equipped with 3.08 ratio gears to improve fuel economy (it was also possible to option these diffs with the higher ratio 3.45 gears). The handbrake cable differs between disc brake and drum brake diffs. Changing a pinion requires tools to measure backlash and gear clearance - without it, the differential wears excessively, and will shorten the life/performance of your diff. 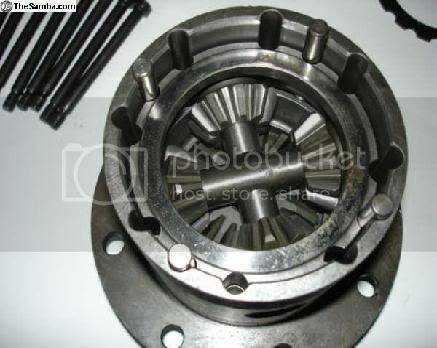 A pinion is removed by unbolting the tail-shaft, leaving the handbrake on/keeping the rear wheels on the ground, and undoing the nut on the front of the diff (previously hidden by the tail-shaft flange). The nut should be marked before it is undone to ensure the correct torque and clearances are maintained (this is not ALL of the necessary measurements/torques required). Changing the centre is a simple operation, however sometimes the centre can be difficult to remove from the housing (which is where the chain/bottle jack method comes into play, bending the housing slightly). When re-installing a differential centre, the original shims must be installed them same way, otherwise excessive wear will result. It should be noted that 25 spline centres use different bearing cups than the larger 28 spline open wheeler and LSD centres, and you cannot re use your original 25 spline bearing cups when converting to a 28 spline BW78 centre. The part number for a single bearing cup is LM102911; you'll need two (one for each carrier bearing). They are worth $8.80 from a bearing shop last time I bought one. VL diff housings do not have a drain plug. Replacement of the oil is achieved by removing the back cover, draining oil, replacing gasket and refitting cover. Drum brake axles have different seals and bearings to discs brake axles. Diff housings are different between sedans and wagons; being that the wagons have differing mounting points for the extra load a wagon can take. Meaning your wagon must take a wagon diff, and your sedan a sedan diff. The axles are the same between wagon and sedan housings. A differential can be tested to determine whether it is an LSD or not in-car by raising the rear end, and rotating one wheel. If they both go in the same direction, it is an LSD. Otherwise, it can be removed from the housing and checked for the presence of a second row of bolts around the ring gear bolts; this indicates it is an LSD centre. This check can also be performed by removing the diff cover and observing the presence of the second row of bolts (without removing the centre from the housing). An open wheel centre (non-LSD "Single Spinner" centre) can be modified to dual-wheel spinning status by installing a "spool". This basically locks the centre of the differential to the rotation of the ring gear, and will cause both wheels to always drive. As there is no limited slip action, it will be a rougher ride for street driving on corners and roundabouts, and more stressful to your axles, and wear your rear tyres faster. They are illegal for street use. A tell tale sign is the "scrape-scrape-scrape" sound when a car that has one fitted is performing low speed manoeuvres. Borg Warner 78 Series differential centres are found in VL-VS Commodores, R31 Nissan Skylines and Pintara's, and XC-XG Falcons. LSD centres were found in VLT's/VLCT's/V8 VL's (where optioned), R31 Skyline Silhouettes, VN-VS SS/V8/S-pak's (where optioned), and XC-XG S-pak and XR6 and XR8 Falcons. Their ring gear and pinions are all interchangeable. Brand new BW centres can be bought without gears from eBay for $275, 28 spline spools for $89.99, new billet axles for $660, and gears vary. Ratios include 3.08 (VL V8, VN-VS), 3.45 (VL, VLT, VLCT), 3.7 (R31 manual), 3.89, 3.9 (R31 auto), and 4.11 (Pintara). 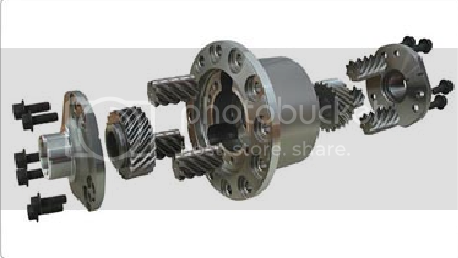 The higher the gear ratio, the more the wheels will rotate in relation to the tail-shaft. 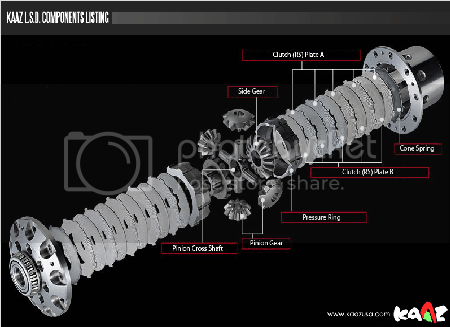 28 spline axles are present in any BW diff using a 28 spline carrier in the centre (VLT/VLCT with 4 pinion LSD, VN-VS [all centres] ); however 28 spline axles from VN-VS may not be used in a VL diff housing (they are too long). Similarly, a VN-VS diff housing (excluding IRS; see below) cannot be bolted onto a VL chassis (they are too wide). To determine the maximum top speed of your car, click on the first link below. You'll need to know your car's maximum rpm (6500rpm for a stock ECU'd VL/VLT), rear tyre width in millimetres (ie: 225, 235, etc), diff gear ratio, and your highest gear's ratio (ie: R33 five speed fifth gear 0.813:1). The second is a similar calculator, with some preset values for different diff gear ratios. It also gives you your results in MPH. I find the first the easiest to use. And here are some links to listings of common transmission options final gear ratios. Highly recommended, as they do not have wearing clutch/clutch plates like other LSDs. Available right here on CT from our very own Missile Performance! Harrop now makes 28 and 31 spline varieties from VL to VT series 1, and VT series 2 to VZ. When removing a ring gear from a centre, the bolts are left hand thread. IRS setups cannot be directly bolted onto a VL chassis (without custom work). There were a handful (and I do mean handful, probably less than five) of Directors that were fitted with IRS. The only mention I have seen of IRS on a VL is as hybrid R32/Z32 IRS, found here. Thanks to 87calais for the reference. Watts Linkages, invented by James Watts, are a live axle set up used by the V8 Supercars. It does away with the panhard rod, and makes use of a central bell crank, mounted on the diff housing, and two (adjustable) arms off the bell crank to the chassis. 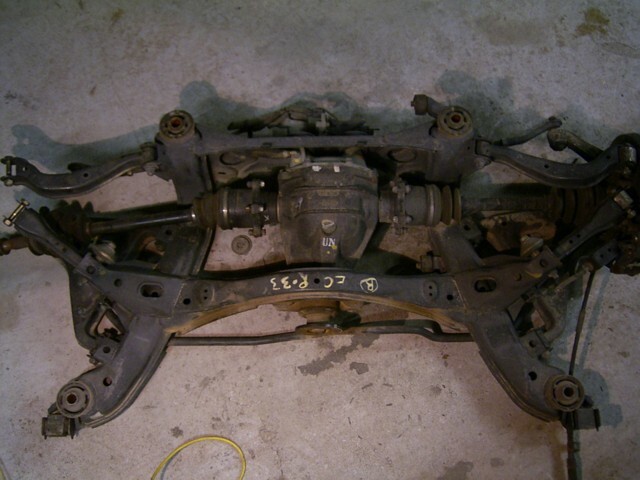 This can also be reversed, where the bell crank is mounted to the chassis, and the two bell crank arms are attached to the diff (as opposed to the chassis). 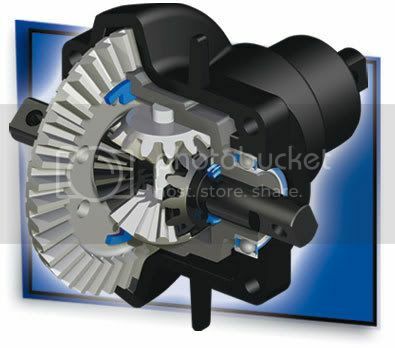 This type of differential set up allows the diff to stay centered below the chassis, despite a change in ride hide due to motion of cornering or bumps. This is great for maintaining tyre/rim to wheel arch clearances in very low track cars. An excellent example of the first type (diff mounted bell crank) is found here. Here is a visual representation of the basic principle of a Watts Link. The red dot is the centre of the rotating bell crank, and the diff would sit horizontally through it. Feel free to make suggestions or corrections, and I shall add/change them. Last edited by 5spdvl; 16-10-11 at 18:21. I'm not sure giantbrandon, but that sounds reasonable to me. I actually thought it meant they were first produced in 1978.
the non-lsd optioned turbo/v8 still had 28spline axels i pretty certain. just an open wheel center. also like to add, calais (nonturbo) came with 25spline disc diffs with lsd being an option, but still retaining 25splines when optioned with lsd. I would say there would be some unusual examples out there as well. No way to really tell, so this is the general consensus on Borgies. so if i want to know if my calais (non turbo) has an LSD from factory (which i doubt) i just raise the rear end and spin a wheel and they should both spin at the same time? Alternatively, you can remove the diff cover, and check if there are two sets of ring gear bolts (which indicate the presence of an LSD hemisphere; guarantees, as a worn diff can perform erratically). Can a 25 spline single wheel center take a 28 spline spool? 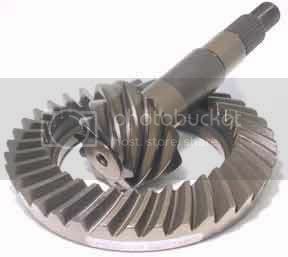 ALL VLT and V8 VL's came factory 4 pinions 28 Spline and had the Option for LSD. the quote from steve need to mention that they are N/A 6cyl ONLY. ALL VLT and V8 VL's had disk brakes, there was no option there. and just to clear up what you said about the wagon diff, its not different so it can take a larger load, its different because the shocks on a wagon bolt to the car in a different position to the sedan. try this. i came accross a VL V8 wagon diff. 4.11 gears.non lsd.disc brake.25 spline. I told the guy theres no way that is a v8 diff and he said"its the 2nd V8 wagon hes wrecked and they both had as above"weird i thought only 2.0 manual's had 4.11 and whats with the 25 spline? i was pissed off i had bought the diff nearly but no thanks.he went on to say his old man works at holden dealership and he couldn't find any record of VL V8 having 4.11 gears, to many things didnt add up but strange how 2 random diff were exactly the same. thats very strange, but as you said way off the truth! I should also point out guy this thread is for Australian released cars; I've no real knowledge of New Zeaand stuff. AFAIK Sailbury diffs were used in VKs, and never used in VLs. I suppose its possible that the odd one could have a Salisbury, although its never mentioned in a manual. Maybe someone put the Salisbury in after factory?